New science and research pathways were the focus of ICRISAT’s Governing Board (GB) meeting in September 2018. A modernized crop improvement program and an updated genebank strategy, including the world’s first ‘green’ genebank, are to be implemented. 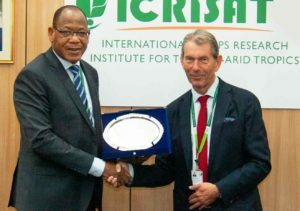 The meeting also saw formal presentations of ICRISAT’s highest scientific recognition, the Doreen Margaret Mashler Award. The first step and inputs into ICRISAT’s new strategic plan was an important session along with the farewells to Governing Board Chair Dr Nigel Kerby, MBE, and Board members Dr SK Pattanayak and Dr Paul Anderson. ICRISAT scientists Dr Mamta Sharma, Theme Leader – Integrated Crop Management, Asia Program and Dr Pooja Bhatnagar-Mathur, Theme Leader – Cell, Molecular Biology & Genetic Engineering, Genetic Gains Program, who were announced as recipients of the Doreen Margaret Mashler Award at the previous Board meeting, formally received the award from the outgoing Governing Board Chair Dr Nigel Kerby and the Vice Chair Dr Trilochan Mohapatra at this meeting. In their presentations, Dr Sharma and Dr Bhatnagar-Mathur highlighted their research in plant pathology and plant biotechnology that has made a significant contribution to food security in the semi-arid tropics. Dr Peter Carberry, Director General (Acting), ICRISAT, who is also Director CRP Grain Legumes and Dryland Cereals (GLDC), presented the progress of CRP GLDC. The 42% representation of women on the Independent Advisory Committee, the launch of the Innovation Fund, the strengthening of the monitoring, evaluation and learning platform, communications initiatives and creating an identity for GLDC were some of the highlights presented. The strengthening of further partnerships including those with the private sector besides the gender internship program were also shared as updates. The Board heard on new initiatives being proposed across the CGIAR and involving ICRISAT. The CGIAR ‘Biofortification Strategy 2019-2023’ provided new strategic direction and targets scale-up in 30 priority countries. 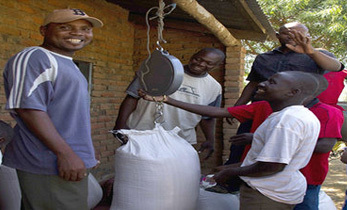 The new ‘DryArc’ Initiative, a joint proposal by International Center for Agricultural Research in the Dry Areas, International Food Policy Research Institute, International Water Management Institute and ICRISAT aims to strengthen resilience of rural communities and agri-food systems across the drylands of Middle East, North Africa, Central and West Asia and sub-Saharan Africa. 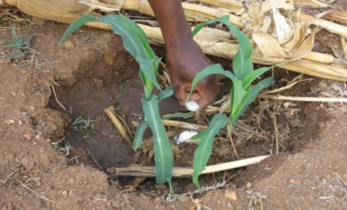 A new climate change proposal, the ‘2-degree initiative’ makes use of over 50 years of CGIAR work to tailor information for policy processes, bring digital agriculture to scale and strengthen partnerships with the private sector, financial institutions and other actors. Dr Jan Debaene, Global Head – Breeding, ICRISAT, presented the update on the ongoing modernization of the breeding program at ICRISAT, driven by Product Profiles with input from multiple stakeholders. The plan aims to optimize generation interval (time) by applying advanced processes, acquiring updated modern equipment and implementing better tools. The Monitoring and Evaluation platform as well as data management within ICRISAT through the MEASURE project were shared by Mr Ram Dhulipala, Head – Digital Agriculture & Youth Innovation Systems for the Drylands, and Mr Satish Nagaraji, Senior Manager – Digital Agriculture (M&E & Tools). This proposes real-time data collection that can be geo-tagged, comprehensively analysed and provide data-driven insights for tracking and action related to the Sustainable Development Goals (SDGs). 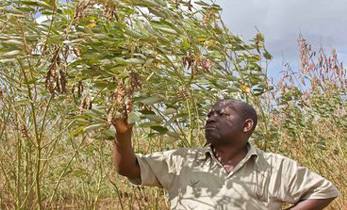 The process for developing ICRISAT’S next strategic plan for 2020-2024 was presented – the current strategy runs 2011-2020. The first major step involved the Board providing strategic input and guidance for the process. The background included the CGIAR draft Business Plan 2019-2030 and the 10 key initiatives that the CGIAR will focus on, as well as ICRISAT’s role. The Board stressed the need to align with the CGIAR Business Plan and the SDGs, and to be careful to focus on our strengths and comparative advantage. Setting ambitious but realistic targets, ensuring the plan is evidence-based, highlighting our science and impacts, and communicating our case were key directions given by Board members. It is planned to have the Strategic Plan ready for approval at the September 2019 Board meeting, seeking staff and stakeholder input over the coming 12 months. This was the last Board meeting for the outgoing Chair, Dr Kerby. Speaking of the innovation, impact and inspiration that the institution held for him, Dr Kerby offered his continued support to ICRISAT. Dr Paco Sereme, Chair of the Program Committee and incoming Board Chair, felicitated Dr Kerby for his contributions. Other changes include Dr SK Pattanayak and Dr Paul Anderson who are leaving the Board and were thanked for their contributions. Dr Kerby recalled how Paul’s presence provided significant inputs to the institution. The Board members expressed their gratitude to Dr Anderson for his commitment and scientific contributions. Dr SK Pattanayak, Secretary, Department of Agriculture, Cooperation and Farmers’ Welfare, Government of India and ICRISAT Governing Board member since 2016, was given a fond farewell at this meeting. 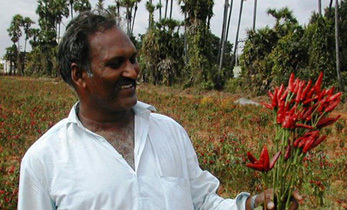 Dr Pattanayak, who retired at the end of September, was recognized and applauded for his contributions, especially in being a key player on designating 2018 as the National Year of Millets. Dr Kerby, spoke of his great calm in providing counsel whenever called on to do so. 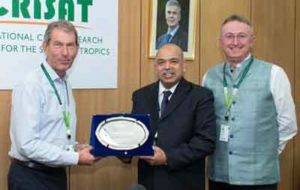 Dr Peter Carberry expressed the hope that he would continue to be involved in contributing to ICRISAT, calling him an ‘incredible supporter’ and a great friend of ICRISAT. Dr Peter Carberry felicitated and honored Dr Pattanayak on behalf of the institution. 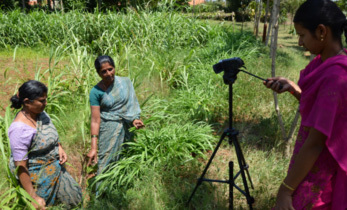 A series of four books that focus on the subject of crop improvement and genomics that make a significant contribution to this area of work has been authored by ICRISAT scientists. The ICRISAT Governing Board released the four books, The Chickpea Genome (Eds: Rajeev Varshney, Mahendar Thudi and Fred Muehlbauer); The Pigeonpea Genome (Eds: Rajeev Varshney, Rachit Saxena and Scott Jackson); The Peanut Genome (Eds: Rajeev Varshney, Manish Pandey and Naveen Puppala), and Genomic Selection for Crop Improvement (Eds: Rajeev Varshney, Manish Roorkiwal and Mark Sorrells). These books were published by Springer Nature. Dr Kerby and Dr Trilochan Mohapatra, Vice Chair, ICRISAT Governing Board and Director General of the Indian Council of Agricultural Research, congratulated the editors. After decoding the genomes of three legume crops, it was important to document the efforts in the area of sequencing and analysis of the legume genomes. The three genome books talk of the importance of the crops, cytogenetics and genetic maps, history and coordination of genome sequencing initiatives, genome sequence and their analysis, trait mapping, transcriptomics and functional genomics, molecular breeding and future prospects of genome sequences. 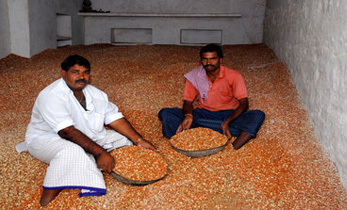 The books present concepts and mythologies of genomic selection, statistical analyses and current status of application of genomic selection in major group of plant species – namely cereals, legumes, vegetatively propagated clonal crops, tree species and also application of genomic selection in hybrid crops. These books by a team of global scientists from ICRISAT and partner universities from USA will serve as quality resources for plant geneticist, breeders and for research scholars working in this domain. Speaking on the release of the books, Dr Rajeev Varshney, Research Program Director – Genetic Gains and Director Center of Excellence in Genomics and Systems Biology and key editor of these books said, “It is always a pleasure to return to the society. Gifting knowledge and wisdom in the form of these books is a great way to give back.” The editors thanked the ICRISAT Governing Board and the Senior Leadership for their continued support and expressed their gratitude to all dignitaries, partners, collaborators and friends for their wishes and also thanked the publisher Springer Nature and Dr Chittaranjan Kole, series editor for their effort in contributing to education and training around the world.